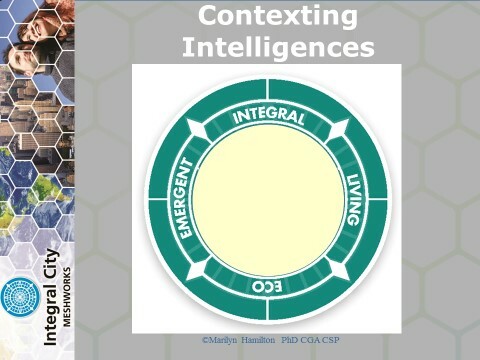 The third Locator nests inside the Smart City and Resilient City Locators – it is the core intelligence chip that reflects the deepest intelligence of the Human Hive – the Integral City Locator. Essentially it offers “Integral Intel Inside”. This chip embeds the core intelligences that enable human systems to be the most advanced life systems on earth. 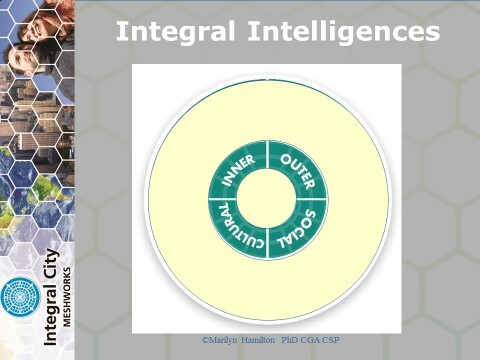 The Integral Integrator is built on the very simple architecture of Inner and Outer, Individual and Collective Capacities. 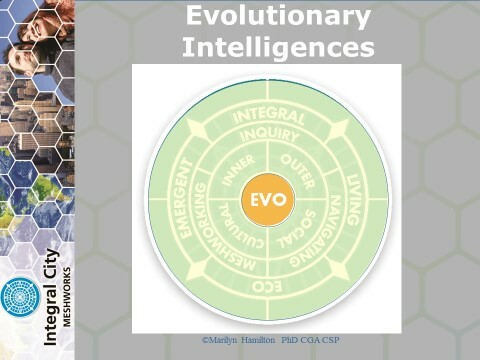 Outer Individual Intelligences include the external objective biological elements of living systems – the analogs of organic structures like hearts, lungs, brains, metabolic systems. The Outer Collective Intelligences include the external inter-objective infrastructural and systemic elements of cities – like the electric grid, transportation systems, and the built environment. Both these Outer Intelligences enable the operation of Smart and Resilient Cities. The Inner Individual Intelligences include the internal subjective phenomena of emotions, consciousness, beliefs, mindfulness and intentions. 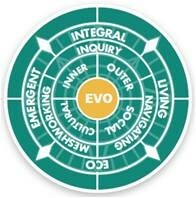 Inner Collective Intelligences include the external intersubjective realities of values, worldviews, vision and culture. While the Smart and Resilient City Locators have depended largely on the Outer Individual and Collective elements of the Integral Locator, the true distinctiveness of the Integral City Locator arises from the power of the Inner Capacities – Individual and Collective Intelligences – that are inherent in city life. Embedded in these Integral zones is the DNA of the Master Code which is expressed through Consciousness, and Culture and the capacity to Care. For as much as we struggle to locate right direction, right action, right Cities, with our strategic Smart City approaches and systemic Resilient City adaptations, it is not until the Integral City Locator adds Care to the equation that we can really sustain and grow the outer capacities of our cities. This is core to the message the Pope’s spiritual call for an Integral Ecology and it may be the missing link in the IPCC’s scientific call for a global strategy to address climate change?? This Integral Locator points to the Caring Capacities – the ones that emerge from our attention to the circles of care in our lives. 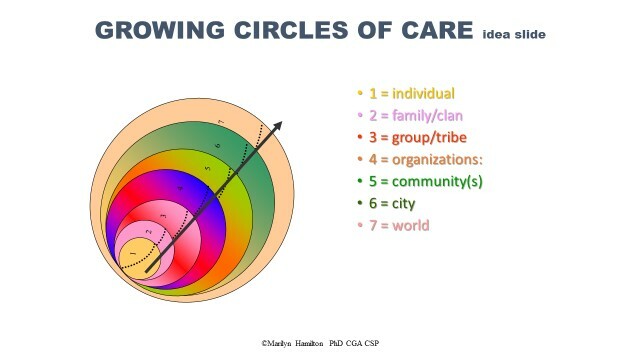 These circles of care begin with caring for ourselves. They grow to caring for others – in our families, clans, neighbourhoods, workplaces. 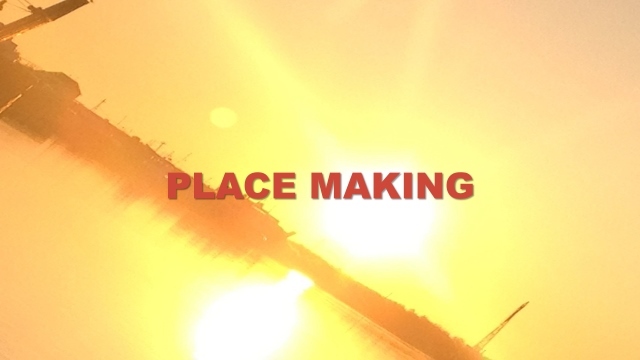 And when those are in place we can expand the care to our places – cities, eco-regions and planet – thus creating an Integral Ecology that embraces both the material world of the Smart and Resilient cities with the consciousness and cultural world of the Integral City and emerging an Ecology of Care. Smart Cities and Resilient Cities can only be sustained with the inner power provided by this Master Code of an Integral City. But there is a true return on investment (ROI) that results by adding Care into the equation for optimizing the Human Hive. Because it turns out that growing Caring Capacity grows Carrying Capacity – the very capacities that Smart and Resilient Cities seek to maximize. The reality and need in the human life is to not only have biological and physical sustenance but to meet the equal (if not greater) need to enjoy personal care and collective belonging. Living the Master Code is what drives change and indeed recalibrates the Human Hive to an integrated inner and outer ecology (i.e. Integral Ecology). People only change when they know others care that they change. For as we expand our capacity to embrace greater circles of care – from self, to others, to place, to planet – we expand our capacity to develop habitats that carry and support the life conditions that we most need to be Smart, Resilient and Integral. This is the indicator that the Integrators of our cities must use and pay attention to – are we enabling Integral Caring Capacity to expand so that it can hold and grow Smart, Resilient Carrying Capacity? The second locator we look at we name the Resilient City Locator. It is like the Motherboard of our intelligence system – it is based on the natural systems we have inherited from Mother Earth. The Resilient City Locator is all about locating our Human Hives in terms of their Ecologies and ecoregions; their Emergent responsiveness to local conditions; and their embedded, recurrent dynamic Life cycles. The Resilient City Locator is all about understanding and responding to the interdependent scales of our cities in terms of their inter-city and intra-city ecologies. The Resilient City intelligences provide Contexts for the Strategies of the Smart City intelligences. It is used by Civic Managers who track the external conditions of the eco-regions of our human hive – from climate, to water, to energy, to population densities – using the language of data relationships to give feedback that tells us if we are going to be successful at not just reaching our target once, but multiple years into the future. The Resilient City Locator focuses on sustainable and resilient systems. It also alerts Business Innovators to threats and opportunities needing remedies, adaptive strategies, innovations and inventions. And finally the Resilience Locator includes a measure of large scale systems integration. And it is working with these patterns that it leads us to the third locator – the Integral City Locator which we will discuss in the next blog.